We've all been there before. It is the 4th quarter of a key Wizards home game. You had so much fun at the pregame DC Sports Happy Hour and you are excited for a Wizards win. The game is close and there is plenty of time left on the clock. The Wizards foul an opponent, and the player steps to the line and misses his free throw. At this point every basket is important, but with minutes left on the clock it is not a severely crucial miss. Before that first shot the crowd was sort of loud, and made a small amount of noise to distract the shooter. It worked well enough. Now the shooter steps up for his second shot. At this point if you aren't looking up at the jumbotron, have never been to a game, or are watching on TV at home, the next situation that transpires will make you wonder what in the world is going on. All of a sudden, out of nowhere, the crowd rises to their feet and the decibel level spikes to a game high apex. The opponent fires up the shot and the ball clangs off the rim and into the hands of an offensive rebounder. A bad but non game ending miss that keeps the Wizards lead at 9 with 10 minutes remaining. Well, everyone in attendance at Verizon Center just won a free chicken sandwich. Yes, it sounded like Oprah just told them their were car keys under each fan's seat, but I assure you, the ruckus was just over a chance to pick up a $4 sandwich for free if you happened to remember the next day. Eventually, after everyone high fives each other and goes back to playing Candy Crush, the game gets tighter and tighter until the Wizards give up a crucial bad foul (most likely called by Joey Crawford). The opponents are back on the line with a chance to cut the lead down to 2 with only minutes remaining! The opponent sinks the first shot. Lead down to 1. And now...now you won't believe what happens. The crowd gets loud. Yup. Loud. Scroll back up and read how I described their previous reaction to a less consequential free throw. I had to crack open a Thesaurus to describe that reaction. But this enormous shot in the closing minutes, a word that a 2 year old can say and understand. The shot misses, the Wizards secure the rebound! What a great turn of events to what appeared to be a bad foul. I think we can win this game! The crowd does a slight murmur of excitement that barely raises above the level before the shot. Nobody is high fiving. Nobody is screaming. Nobody is chanting "CHICKEN! CHICKEN!" like they did before (seriously happens). What turns out to eventually be the missed shot that wins the Wizards the game and it didn't even get the biggest reaction of the night. Why? Because the free chicken was out of play. Some (not all of course) fans at the game cared more about the chicken sandwich then they did about the win. It is extremely frustrating to the die hard fans, especially in situations where the fans win chicken and the team loses the game. People smile as they walk out of a loss because they saved 4 bucks. So after that long story that haunts me every 4th quarter, I would like to call on Wizards fans to take a stand!  We here at DC Sports Happy Hour want to get fans to the level we know they are capable of! To levels we've witnessed first hand in this awesome city! It exists inside of each and every one of you! Inspirational Quote! 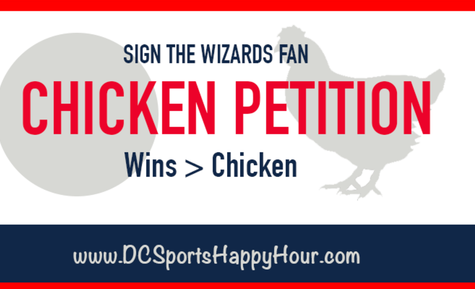 Help us: By signing this petition, you promise to tear up your ticket after the game if the Wizards lose and the opponent wins you a free chicken sandwich. Let's show the rest of DC what real fans care about. Winning games. If we are at Verizon Center it probably means we can afford a chicken sandwich anyway. And heck, we can probably even drop some extra cash for some waffle fries.